How do I treat sore muscles? After a tough day at work, or a fierce battle on the field—your muscles may feel overworked, tight, tender, and just plain ready for some TLC. So what are you doing to give them some? Some people find it easier to ignore the pain and live with it when there is really no need. Here are 5 quick tips that will take your muscles from meltdown to mush! 1. Stretch. Whether you are sitting at a desk all day, or preparing to run 5K you should be doing activity appropriate stretching. For example, sitting and staring at your computer screen is bound to add undue stress to all the muscles in your head and neck. Taking your neck through the 6 cardinal range of movement (look up, down, left, right, and laterally bend your ear to shoulder on each side) is a simple pattern you can perform throughout the day to ease the tension in your cervical spine and surrounding musculature. Make sure to use your hand to increase the stretch in all but extension (looking up) and hold for a minimum of 20 seconds. Repeat these throughout the day to stay both mobile and pain-free. Dr. Huggins can help provide you with customized stretches for all regions of the body! 2. Hydrate. Drinking water seems like a simple enough routine, your body needs it, asks for it, so provide it! Aim to drink 2 litres throughout the day, and more when enjoying caffeinated or alcoholic beverages and warm days in the sun. Hydrated muscles are less painful and move with greater ease. Remember to replenish electrolytes after sporting events or events that cause perspiration. Keep a reusable bottle on hand and keep refilling between home, work, the gym, and even our office! 3. Epsom Salts. Initially discovered in Epsom, England, these salts made of magnesium sulphate have the ability to soothe sore muscles, decrease stress, and remove toxins from the body leading to better sleep, increased energy, and improved wellness. Add 2 cups of the salts to a warm bath and soak for at least 20 minutes. 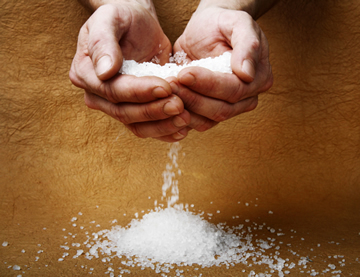 Epsom salts can be purchased from anywhere from Bulk Barn to your local pharmacy. Try to do your soak before bed or on a day where you can decompress afterwards as you may feel ready for a nap! 4. Check your pillow! Do you feel yourself bunching up your pillow at night? Trying to find the right way to fill the gap between your neck and the bed? Maybe your pillow isn’t offering your enough support for your cervical spine. Ask Dr. Huggins to suggest pillow that accommodates your size, sleeping position, and works with the condition of your spine. Tip: Your chin should be raised ever so slightly to ensure your neck stays inline and neutral with the rest of your spine. 5. Get your neck checked by your Chiropractor, Dr. Huggins! You may be experiencing pain and discomfort in your musculature because of a root problem or imbalance in the vertebrae of your spine. The facet joints that allow your neck to move through the ranges of motion may be stuck, fixated, or known in the Chiropractic world as “subluxated”. This means they require the professional care of your chiropractor who will detect and in turn correct these subluxations by performing a chiropractic adjustment to “unstick the joints” and allow the bones and joints to move freely. Once the structural problem is addressed, the muscles will ease from their tense state and lengthen and shorten properly as the body will be once again balance and will not cause unequal pull or tension to the surrounding muscles. Make your appointment at Oakville Chiropractic today to get all aspects of your spine addressed! Dr. Huggins will provide you with a history, exam, x-rays, and findings to help determine your current condition and set you on a path to health and wellness. Blog readers save on their first visit when they call 905-845-2291 and give the code BLOGTH to receive their first visit at half price!